from the 5th to the 16th century A.D. Soil samples taken from two adjoining fields close to the village of Puxton in the county of North Somerset, UK, were analysed in 1997 for heavy metals, phosphorus, magnetic susceptibility and loss on ignition as part of an archaeological investigation of the origins and development of a medieval settlement. 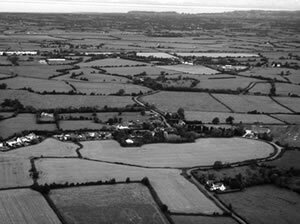 It had been argued that an oval-shaped field next to the church was the nucleus of marshland reclamation during the early medieval period, though it was unclear whether the enclosure was occupied by a settlement or was simply an area of embanked agricultural land. Soil chemistry shows certain elements, including phosphorus and the heavy metals (Pb, Zn, Cd, Cu, etc), to be concentrated in a restricted part of the enclosure, which earthwork, resistivity and fieldwalking surveys suggest correlated with the area of human occupation associated with the dumping of midden material near by (a hypothesis confirmed through excavation). This paper demonstrates the value of multifaceted soil chemistry, alongside a range of other survey methods, for characterising the nature of human activity on archaeological sites, which in the future may be used to locate previously unrecorded sites in more speculative landscape surveys. The School of Geography, Archaeology and Earth Resources, University of Exeter website. Volume 62/2 of Medieval Archaeology is available online now via Taylor and Francis here. exists to further the study of the period from the 5th to the 16th century A.D.